Little Murph sits outside the entrance gates of Nemours/Alfred I. duPont Hospital for Children. The Nemours bell tower is visible just over Murph's shoulder. A view from the back showing the porch. Note the pink stucco over brick. Today is the fourth of July, 2011, 235 years since the birth of our nation. 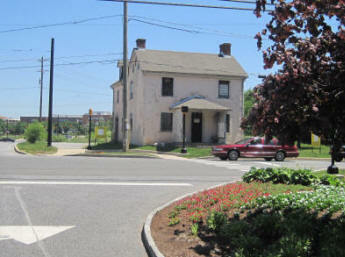 In one month, Delaware's Murphy House, built in 1840, is scheduled for demolition. Today the little house sits on it's stone foundation at the entrance of the Nemours complex for it's 171st year, that's 73% of the entire time our country has been declared an independent nation. The Nemours foundation is the sole beneficiary of the A.I. duPont Testamentary Trust which was valued at $3.4 billion in 2009. Standing next to Little Murph one can see the stone wall that surrounds the Nemours hospital and mansion and the carillon bell tower that A.I. DuPont is buried in. You can also see the gigantic Astra Zeneca complex a few hundred yards away. One can imagine a former occupant of the house sitting on the front porch watching the construction of the massive Nemours wall in 1909, or pondering the scaffolding around the bell tower construction site in 1932. 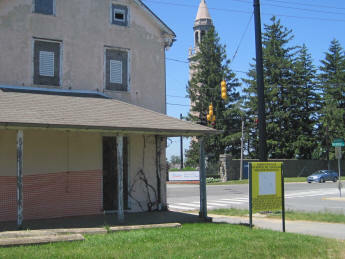 Why is this old house scheduled for demolition? It hasn't been occupied since the 1980s and the inside is in deplorable condition. 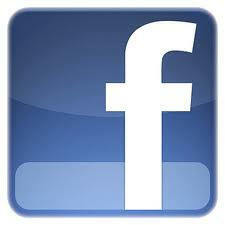 But it is structurally sound and the outside is respectable, and can be renovated and put to many good uses. The ground that it occupies does not have any planned use; it will become a grassy lot. Delaware Department of Transportation (DelDOT) owned the house until 2009 when it gave it away to Nemours gratis as part of a deal to restructure the whole area to accommodate expansion of the Astra Zeneca complex changing the roadways, adding parks, expanding the golf course and so on. 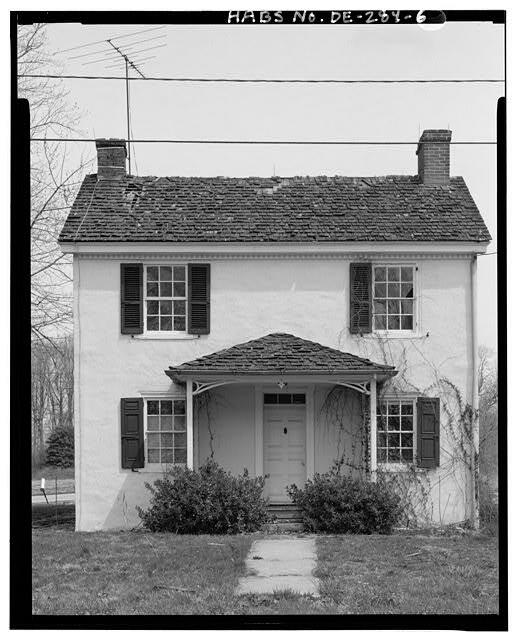 Nemours accepted the house along with the deed restriction and agreements to preserve the house for Delaware history. Now, in spite of the deed restriction and agreement to preserve, Nemours is planning on wiping the lot clean and hauling the pile of sticks and stones off to the landfill. How can this happen? Some people seem to care, but few care enough to take any action to prevent this from happening. 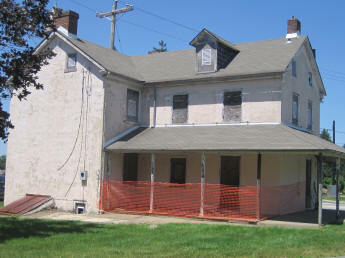 So unless Nemours is challenged, one of the oldest structures in New Castle County, Delaware will meet the fate of countless other historic buildings around the state, and disappear into the back pages of musty books on Delaware history. We are committed to doing "whatever it takes" to insure our patient-families, visitors, colleagues and business partners experience a uniquely satisfying experience each time they interact with Nemours. Now this particular house is not a shining example of any stunning style of architecture. 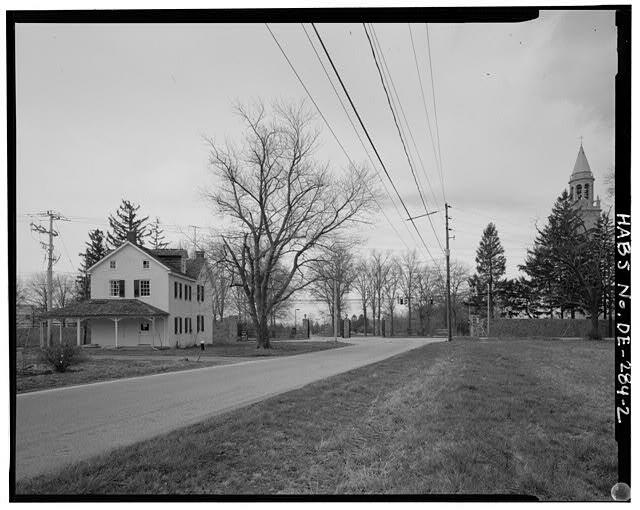 It is simply a vernacular farm house, typical of it's day at a time when our state's population was thin and houses were few, but those houses were built to last, even a simple farm residence. The builders of the house, just common men, put together wood, brick, mortar, and stucco using building techniques of the time erecting a structure that stands solid 171 years later. Saving the Murphy House, restoring it and putting it to good use would represent more than just saving one old house. It would represent displaying the good values of a community, showing respect for our past, the good things of our past, something that Europeans do routinely, something that Americans rarely do. Our quick buck mentality steers us to get rid of old things and replace them with flimsy short lived commercial throw-aways that has resulted in miles of fast food joints and dollar stores servicing acres of plastic monopoly houses in the surrounding neighborhoods. Little Murph, sitting lonely at the gates of Nemours, awaiting it's fate, is one of the last representations of a past age in our county and state. Residents of the house probably marched off to the Civil War. Everyone who was alive when it was built is now dead, along with all of their children and grand children. That's how old the house is. It's hard to put it into perspective any other way and appreciate it's age. Isn't the fact of it's age alone worth the effort to preserve it? It does seem ironic that it will be the Nemours Foundation, whose very reason for existence is to preserve the DuPont mansion, grounds and out buildings, who will sign the check to demolish Little Murph. 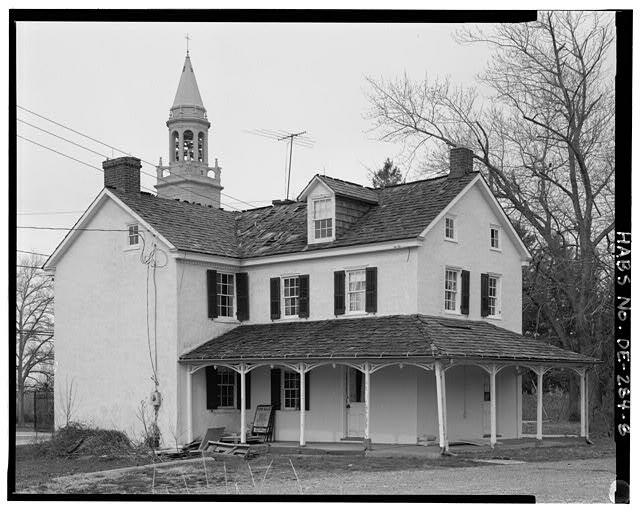 When Alfred I. DuPont gave his property and fortune to the people of Delaware with the stipulation to his trustees to preserve the building and grounds for the benefit of the people, one may extrapolate that he would also have wanted the smaller buildings in the area preserved as well. What would it take to preserve it? Money. What is money? A representation of work. "We don't have the extra money now in this recession, so we'll demolish the house". Later, when we do have the money, there will be no house to spend it on. If we don't spend the money on the preservation of the old house, what will we spend it on? Something, assuredly. Something more worthwhile? Is it really truthful to say that if money is spent on the house, children will not get the care they deserve at the hospital? I read about the fate of Little Murph several months ago in the News Journal, in an article written by Robin Brown. For decades I've been reading articles in this newspaper about various historic structures being demolished for malls and housing developments. When preservation groups try to stop this from happening, and are close to success, it's uncanny how a squatter gets inside the building and accidently sets fire to the property until it is beyond repair and must be demolished for safety's sake. I took it upon myself to draw the line at the gates of Nemours. If a responsible, dedicated, philanthropic organization like Nemours can get away with ignoring their promises to preserve, and no one objects, then no historic building is safe in Delaware. SaveTheMurphyHouse.Org consists of one member, one citizen who cares, me. I decided to check around with various politicians and preservation groups and put together an overall picture of the attitudes of various stake holders towards historic preservation in Delaware. This is a synopsis of my research.